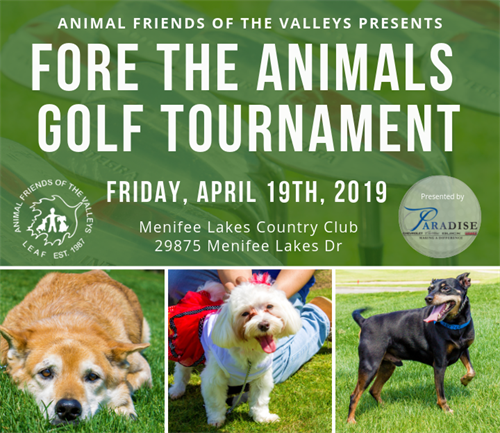 Animal Friends of the Valleys is thrilled to announce our annual FORE the Animals Golf Tournament presented by Paradise Chevrolet Cadillac Buick GMC! This year’s event will take place at Menifee Lakes Country Club and will include 18 holes of golf on a beautiful course, Live and Silent Auctions, complimentary breakfast and banquet lunch, and more! The best part? All of the proceeds from this event will benefit Animal Friends of the Valleys in our mission to find loving forever homes for all of the lost and homeless animals in our valleys! Want to play? Visit fore2019.eventbrite.com to purchase your tickets today!